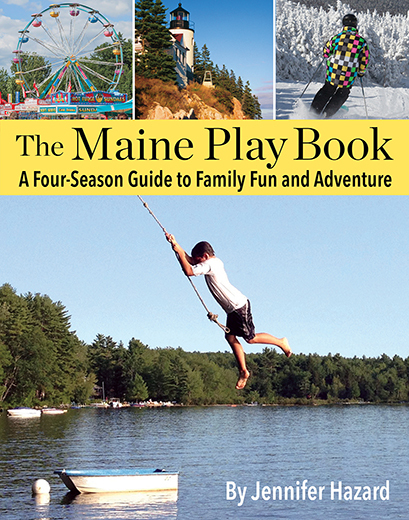 MP has been a fan of the Coastal Maine Botanical Gardens (CMBG) in Boothbay for as long as she can remember. With over 295 acres of woodland and shorefront property, the lush grounds are made for people who adore plants, flowers and the Maine outdoors. CMBG is also home to a spectacular Children’s Garden, complete with fairytale cottages, a treehouse with a rope bridge, and engaging pathways to explore. When CMBG began its holiday light show in 2015, MP put the event on her wish list of things to do. There is nothing like seeing 500,000 colorful lights to help put a family in the holiday spirit! As you can imagine, a popular event like this one requires some forethought. The smart folks at CMBG offer advance tickets with designated entrance times (4:00 p.m., 6:00 p.m., 7:30 p.m.) to stagger crowds. On the evening of our visit, we left early—a rarity for us— and we’re so glad we did. The traffic on the road leading to the entrance was backed up for 30 minutes. Despite the unexpected delay, the show itself did not disappoint. Visiting Gardens Aglow is like being in a Dr. Seuss story with twinkling lights. Everywhere we looked, we were met with color — cool blues and violets, vibrant reds and rosy pinks, glowing golds and electric whites. We walked the pathways through the gardens, over magical covered bridges and under arbors trimmed in lights. The kids also spent time searching for fairy houses, where clues to a scavenger hunt could be found. While there were many other people exploring the gardens, we never once felt packed in. We could walk leisurely and take our time enjoying the views. The weather was mild the night we visited, but there are stations along the way for warm cups of cocoa. You’ll even find an outdoor fireplace to make s’mores. If you’re hungry, the Garden Cafe is also open. There is so much to enjoy exploring the gardens, but much like in the summer months, we loved the Children’s Garden best. Here, holiday music plays brightly in the background. And the strings of lights covering the pond created a shimmery reflection in the water. The fairytale cottages that we admire were also trimmed in lights, making the space all the more magical. Perhaps only the North Pole itself could rival the holiday magic that’s happening at Coastal Maine Botanical Gardens. We highly recommend a visit with your family. To learn more about Gardens Aglow or to order tickets, visit here. The event runs through December 31. PS: Our first visit to Coastal Maine Botanical Gardens.